Ferrous sulphate is an inorganic salt of iron used to treat iron deficiency anaemia and maintain the overall health in our body. The current study was designed to evaluate the impact of The Trivedi Effect®-Energy of Consciousness Healing Treatment on the physicochemical and thermal properties of ferrous sulphate using PXRD, PSA, DSC, and TGA/DTG analysis. Ferrous sulphate test item was divided into two parts, one part was considered as control (without Biofield Energy Treatment), whereas the second part received The Trivedi Effect®-Biofield Energy Treatment remotely by the renowned Biofield Energy Healer, Alice Branton. The PXRD data revealed that the relative intensities and crystallite size of the characteristic diffraction peaks in the treated sample were significantly altered from -26.74% to 421.23% and from -24.93% to 42.91%, respectively compared with the control sample. The average crystallite size of the treated sample was significantly increased by 6.39% compared to the control sample. The particle size values at d10, d50, d90 and D(4, 3) values were significantly increased by 30.43%, 35.94%, 19.49%, and 26.26%, respectively and the surface area was significantly decreased by 53.26% compared with the control sample. The melting temperature of the treated sample in the 1st and 3rd peaks was increased by 1.61% and 1.04% respectively, whereas decreased by 5.71% and 1.04% in the 2nd and 4th peaks, respectively compared with the control sample. Consequently, the total latent heat of fusion to transition from FeSO4•7H2O to FeSO4 was decreased by 0.44% in the treated sample compared with the control sample. The TGA thermograms of both the samples exhibited four steps of thermal degradation. The total weight loss in the treated sample was increased by 0.62% compared with the control sample. The maximum thermal decomposition temperature (Tmax) of treated sample was increased by 5.81% and 0.26% in the 1st and 4th peak respectively, but the Tmax of 2nd and 3rd peaks were decreased by 2.58% and 2.38%, respectively compared to the control sample. Overall, DSC and TGA/DTG of the treated sample showed that the thermal stability was changed compared with the control sample. The Trivedi Effect®-Consciousness Energy Healing Treatment might lead to the production of a polymorphic form of ferrous sulphate, which would have better powder flowability and appearance with altered thermal stability compared to the control sample. Alice’s Biofield Energy Treated ferrous sulphate would be useful to design better nutraceutical/pharmaceutical formulations, which could provide better therapeutic response against iron deficiency anaemia. Ferrous sulphate or iron (II) sulphate traditionally also known as "green vitriol" or "copperas", which exists mostly in heptahydrate (FeSO4·7H2O) form . It is useful as the best source of iron for the supplement and reducing agent in the chemical reactions. The hydrated form of ferrous sulphate is very important and used as medicine for the treatment of iron deficiency anaemia . It is also used for the manufacture of inks (iron gall ink), treating iron chlorosis in horticulture, lawn conditioner, gold refining, purification of water, wood panelling on houses, moss killer, and as a catalyst (Fenton's reagent) in chemical reactions [3-7]. Problems associated with the internal use of ferrous sulphate are stomach upset, constipation, black/dark-coloured stools, and staining of the teeth. It is in water (29.51g/100 mL at 25°C) and negligible in organic solvents [3, 8]. The complex physiological system of the human body and other dietary factors, only 1-2 mg of iron undergoes absorption through the gut enterocyte to the systemic circulation [9, 10]. Iron deficiency is the most common nutritional disorder affecting more than 20% of the global population according to the World Health Organization (WHO). The solubility and bioavailability of the ferrous sulphate are the major concern for the effective therapeutic effect. The Trivedi Effect®-Consciousness Energy Healing Treatment could be an economical approach for modifying particle size/crystallite size, surface area and thermodynamic stability that would be helpful for better design for pharmaceutical/nutraceutical formulations [11, 12]. Biofield is referred as quantum energy matrix that surrounds the human body resulting from the continuous movement of the electrically charged components (ions, cells, etc.). The human body can release the electromagnetic waves in the form of bio-photons that surrounds the body. Biofield Energy Healers have the ability to harness the energy from the “Universal Energy Field” and can transmit into any living or non-living object(s). The process by which the objects receive the Biofield Energy Treatment from the Biofield Energy Healer(s) and respond in a useful way is called as Biofield Energy Healing [13-15]. Biofield based Energy Therapies are used worldwide to improve the quality of life. National Center of Complementary and Integrative Health (NCCIH) has recognized and accepted Biofield Energy Healing as a Complementary and Alternative Medicine (CAM) health care approach in addition to other therapies, medicines and practices such as yoga, meditation, deep breathing, Qi Gong, Tai Chi, chiropractic/osteopathic manipulation, Ayurvedic medicine, homeopathy, naturopathy, traditional Chinese herbs and medicines, aromatherapy, special diets, essential oils, massage, progressive relaxation, guided imagery, acupressure, acupuncture, healing touch, hypnotherapy, movement therapy, rolfing structural integration, pilates, mindfulness, Reiki, cranial sacral therapy and applied prayer, which are very common in religions like Hinduism, Christianity, Buddhism, etc. . The Biofield Energy Healing Treatment (The Trivedi Effect® - Energy of Consciousness Healing Treatment) had been scientifically evaluated and reported with significant results in different scientific fields like materials science [17-21], agricultural science [22-25], cancer research [26, 27], microbiology [28-30], pharmaceutical [12, 31, 32], genetics [33, 34], etc. The physicochemical properties play an important role in bioavailability , and physicochemical and thermal properties are scientifically proved to be altered by The Trivedi Effect® - Energy of Consciousness Healing Treatment might be the possible mediation of neutrinos . Thus, the current study was designed to evaluate the impact of The Trivedi Effect® - Energy of Consciousness Healing Treatment on the physicochemical and thermal properties of ferrous sulphate using powder X-ray diffraction (PXRD), particle size analysis (PSA), differential scanning calorimetry (DSC), and thermogravimetric analysis (TGA)/ Differential thermogravimetric analysis (DTG). Ferrous sulphate heptahydrate or iron (II) sulphate heptahydrate (>99%) was purchased from Sigma-Aldrich, India. All other chemicals used during the experiments were of analytical grade available in India. The test compound, ferrous sulphate was divided into two parts. One part of the test compound did not receive Biofield Energy Treatment and considered as untreated or control ferrous sulphate. The second part of the test compound received the Energy of Consciousness Healing Treatment by the renowned Biofield Energy Healer, Alice Branton (USA), and designated as the Biofield Energy Treated iron (II) sulphate. The Trivedi Effect® - Energy of Consciousness Healing Treatment was provided for 3 minutes through the Healer’s Unique Energy Transmission process remotely to the test compound, which was kept under laboratory conditions. Similarly, the control compound was subjected to “sham” healer under the similar laboratory conditions. The sham healer did not have any knowledge about the Biofield Energy Treatment. After that, the Biofield Energy Treated and untreated samples were kept in similar sealed conditions and characterized using PXRD, PSA, DSC, and TGA techniques. The particle size analysis of ferrous sulphate was conducted on Malvern Mastersizer 3000, UK with a detection range between 0.01 µm to 3000 µm using wet method [11, 12, 35, 36]. The sample unit (Hydro MV) was filled with a dispersant medium (Light liquid paraffin oil) and operated the stirrer at 2500 rpm. Refractive index values for dispersant and samples were 0.0 and 1.47. The measurement was taken twice after reaching obscuration in between 10% and 20%, and the average was taken of two measurements. Consequently, PSA analysis of ferrous sulphate was repeated for three times to obtain the average particle size distribution. d10 µm, d50 µm, and d90 µm represent particle diameter corresponding to 10%, 50%, and 90% of the cumulative distribution. D(4, 3) represents the average mass-volume diameter and specific surface area (SSA, m2/Kg). The calculations were done by using software Mastersizer V3.50. Where, SControl and STreated are the surface area of the control and Biofield Energy Treated ferrous sulphate, respectively. Where, ∆HControl and ∆HTreated are the latent heat of fusion of the control and treated ferrous sulphate, respectively. Where, WControl and WTreated are the weight loss of the control and Biofield Energy Treated ferrous sulphate, respectively. PXRD data of the control and Biofield Energy Treated ferrous sulphate showed sharp and intense peaks in the diffractograms (Figure 1) indicating that both the samples are crystalline in nature. The crystallite size was calculated with the help of Scherrer equation . PXRD data such as the Bragg angle (2θ), relative intensity (%), and crystallite size (G) for both the sample are presented in Table 1. 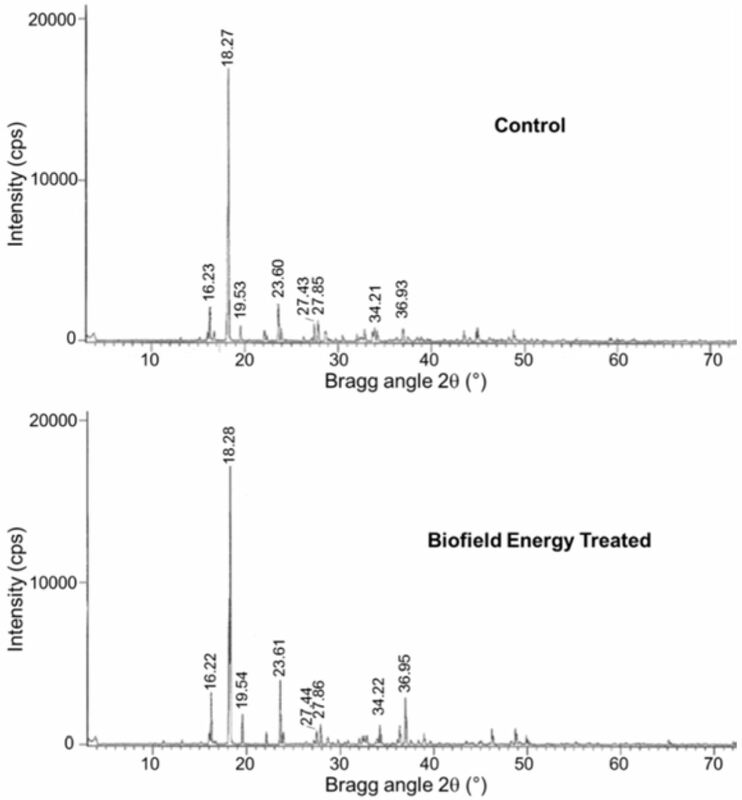 The highest intense peak (100% relative intensity) in the control and Biofield Energy Treated samples was observed at Bragg’s angle (2θ) equal to 18.3° (Table 1, entry 2). The Bragg’s angle (2θ) of both the samples remained almost same, but the relative intensities of the peaks of the Biofield Energy Treated sample were found to be altered compared to the control sample. Thus, relative peak intensities of the Biofield Energy Treated ferrous sulphate were significantly altered in the range of -26.74% to 421.23%. However, the overall intensity of characteristic diffraction peaks improved after the Alice’s Biofield Energy Treatment. The crystallite size values of the Biofield Energy Treated sample at 2θ equal to nearly 23.6°, 27.9°, 34.2°, and 36.9° (Table 1, entry 4 and 6-8) was significantly increased from 20.00% to 42.91% with respect to the control sample. On the contrary, the crystallite sizes of the control and Biofield Energy Treated samples at 2θ equal to nearly 18.3°, 19.5°, and 27.4° (Table 1, entry 2, 3, and 5) were significantly decreased from 12.51% to 24.93% in the Biofield Energy Treated sample in comparison to the control sample. The crystallite size of the control and Biofield Energy Treated ferrous sulphate samples at position 2θ equal to nearly 16.2° (Table 1, entry 1) remained unchanged. The overall crystallite size was significantly altered in the range from -24.93% to 42.91% and average crystallite size significantly increased by 6.39% in the Biofield Energy Treated ferrous sulphate compared with the control sample. The changes in the XRD patterns such as crystallite size and relative intensities indicated the change of the crystal morphology as well as the proof of polymorphic transition [38-40]. As the crystallite size of the Alice’s Biofield Energy Treated sample was significantly increased compared with the control sample, which might produce a new polymorphic form of ferrous sulphate. The alteration in crystal morphology, i.e. crystal pattern, size and even polymorphic form has the significant impact on the in vitro dissolution rate, which is directly related with the bioavailability of orally administered pharmaceutical and nutraceutical compounds [41, 42]. Figure 1. PXRD diffractograms of the control and Biofield Energy Treated ferrous sulphate. Table 1. PXRD data for the control and Biofield Energy Treated ferrous sulphate. The particle size and specific surface area of the control and Biofield Energy Treated ferrous sulphate were investigated and presented in Table 1. It was observed that the particle size in the Biofield Energy Treated sample at d10, d50, d90 and D(4, 3) values were significantly increased by 30.43%, 35.94%, 19.49%, and 26.26%, respectively compared to the control sample (Table 2). The surface area of the control and Biofield Energy Treated sample was found to be 44.93 m2/kg and 21.00 m2/kg, respectively. The results indicated that the surface area of the Biofield Energy Treated ferrous sulphate was significantly decreased by 53.26% compared with the control sample. Table 2. Particle size distribution of the control and Biofield Energy Treated ferrous sulphate. The particle size and surface area of a pharmaceutical or nutraceutical compound play a vital role in the solubility, dissolution, absorption, and bioavailability [42, 43-45]. The introduction of the Biofield Energy Treatment might transform the fine particles into larger particles. The increased the particle size enhanced the flowability, shape, and appearance of the compound [45, 46]. It is assumed that The Trivedi Effect® - Energy of Consciousness Healing Treatment might improve the powder flowability of ferrous sulphate. Scientific literature nicely described the dehydration behavior of a hydrated iron salt, ferrous sulphate heptahydrate (FeSO4•7H2O) by using DSC and TGA techniques [47, 48]. Wang et al mentioned 3 peaks in the DSC curve at a heating rate of 10°C under nitrogen atmosphere. 1st peak at temperature below 100°C, 2nd peak at 85 to 149°C, and 3rd peak at 247 to 342°C were due to the dehydration of 7 water molecules from FeSO4•7H2O to FeSO4•4H2O, FeSO4•4H2O to FeSO4•H2O, and FeSO4•H2O to FeSO4, respectively. They also concluded that accurate thermal data from the TGA/DSC dehydration experiments depends on various factors like proper selection of the heating rate, particle size, open or closed pan, etc. . The DSC thermograms of the control ferrous sulphate heptahydrate (Figure 2) exhibited the presence of the four endothermic peaks at 72.73, 100.20, 114.73, 279.47°C. The 1st sharp endothermic peak at 72.73°C was the melting point of ferrous sulphate heptahydrate. Consequently, the melting temperature of Biofield Energy Treated ferrous sulphate heptahydrate was significantly increased by 1.61% with a significant enhancement of the latent heat of fusion (∆H) by 9.98% (Table 3) compared with the control sample. The 2nd broad endothermic peak at 100.20°C might be due to the dehydration of 2 molecules of water from FeSO4•6H2O to FeSO4•4H2O. 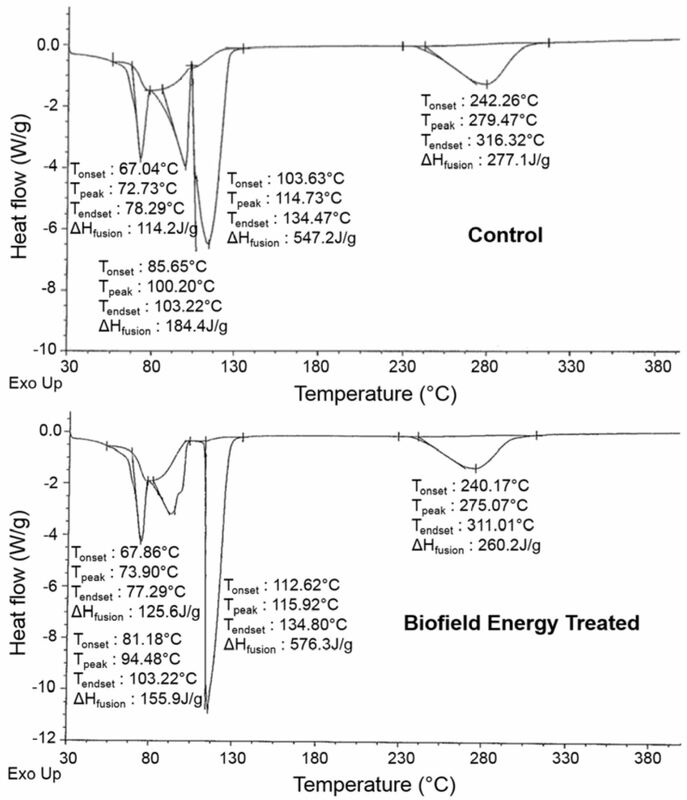 This endotherm temperature in the Biofield energy Treated sample was reduced by 5.71% with a significant reduction in ∆H compared with the control sample. The melting temperature of the 3rd sharp endothermic peak, which was due to the removal of 3 molecules of water from FeSO4•4H2O to FeSO4•H2O was increased by 1.04% with a significant increase of ∆H by 5.32% compared with the control sample. Finally, a broad endothermic peaks at 279.47°C was observed in the control sample due to the dehydration from ferrous sulphate monohydrate to anhydrous FeSO4. 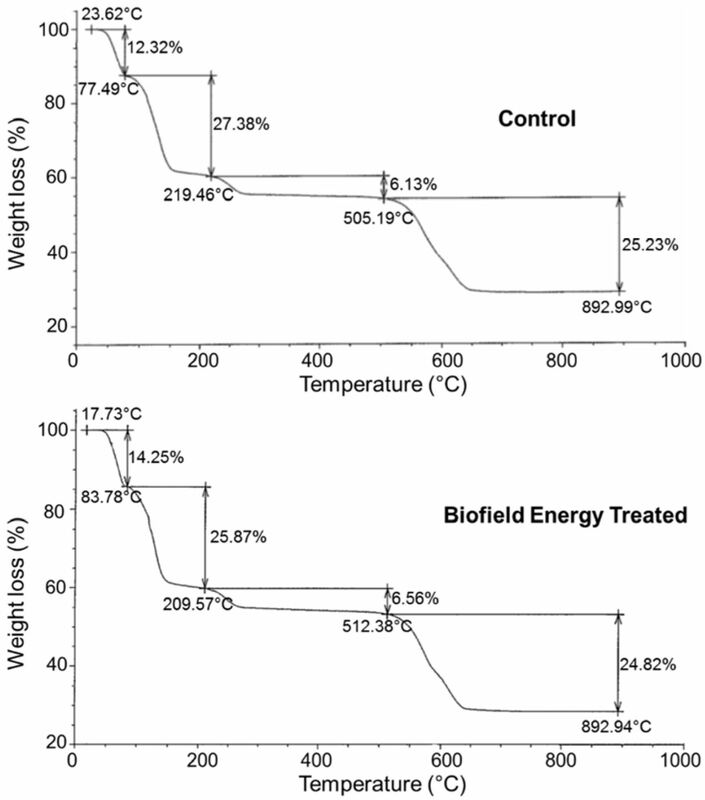 This melting temperature was reduced by 1.57% in the Biofield Energy Treated sample with a significant decrease by 6.10% in ∆H compared with the control sample (Table 3). The total latent heat of fusion to transition from FeSO4•7H2O to FeSO4 was decreased by 0.44% in the Biofield Energy Treated sample (1118.00 J/g) compared with the control sample (1122.90 J/g). The DSC analysis suggested that the thermal stability of the Biofield Energy Treated ferrous sulphate heptahydrate was increased compared with the control sample. Table 3. The melting point (°C) and latent heat of fusion (J/g) values for both control and Biofield Energy Treated samples of ferrous sulphate. ∆H: Latent heat, *denotes the percentage change of the Biofield Energy Treated sample with respect to the control sample. Figure 2. DSC thermograms of the control and Biofield Energy Treated ferrous sulphate samples. The TGA thermogram pattern of the control sample (Figure 3) was matched with the literature. The first weight loss occurs between 70 and 90°C due to the loss of 3 water molecules from FeSO4•7H2O. The second dehydration step with the loss of 3 water molecules from FeSO4•4H2O is responsible for the mass loss between 140 and 200°C. Consequently, the third weight loss is found between 270 and 350°C due to the dehydration of FeSO4•H2O. Final major weight loss between 400 and 830°C occurs due to the oxidation and dehydration of the other part of monohydrate, sulphate decomposition. The major weight loss occurred in the first (38.30%) and fourth (28.30%) reactions [47, 48]. 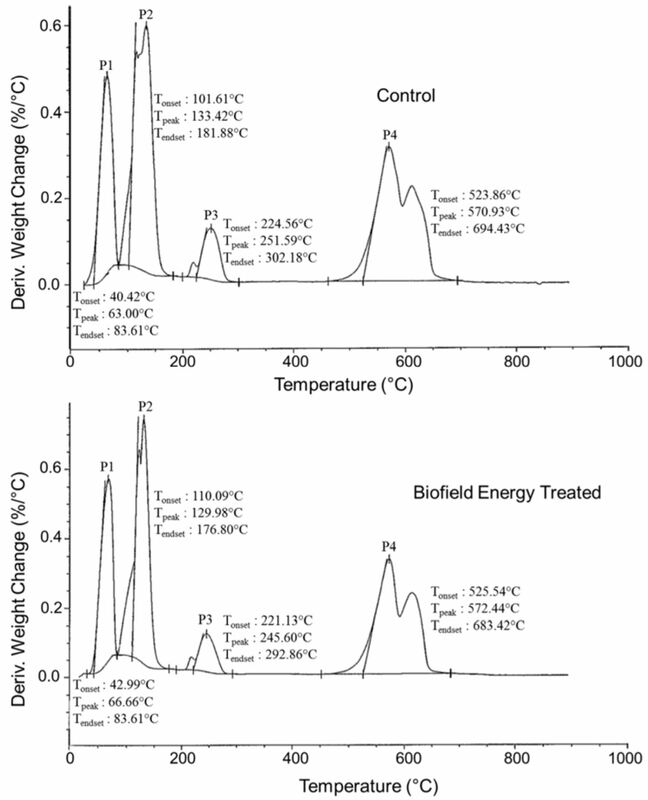 Here, the TGA thermograms of the control and Biofield Energy Treated samples (Figure 3) exhibited four steps of thermal degradation, which was matched with the literature [47, 48]. The % weight loss in the Biofield Energy Treated ferrous sulphate was significantly increased by 15.67% and 7.01% in the 1st and 3rd steps of degradation, respectively compared with the control sample. Consequently, the % weight loss in the 2nd and 4th steps of degradation was reduced by 5.51% and 1.63%, respectively, compared with the control sample (Table 4). The total % weight loss of the control and Biofield Energy Treated ferrous sulphate were 71.06% and 71.5%, respectively. The total weight loss in the Biofield Energy Treated ferrous sulphate was increased by 0.62% compared with the control sample. Figure 3. TGA thermograms of the control and Biofield Energy Treated ferrous sulphate. Table 4. Thermal degradation steps of the control and Biofield Energy Treated samples of ferrous sulphate. *denotes the percentage change of the Biofield Energy Treated sample with respect to the control sample. The DTG thermograms of the control sample disclosed four peaks P1, P2, P3, and P4 with maximum thermal decomposition temperature (Tmax) of 63.00, 133.42, 251.59, and 570.93°C, respectively (Figure 4 and Table 5). Similarly, the DTG thermograms of the Biofield Energy Treated sample disclosed four peaks P1, P2, P3, and P4 with Tmax of 66.66, 129.98, 245.60, and 572.44°C, respectively (Figure 4 and Table 5). The analysis indicated that the Tmax of the Biofield Energy Treated ferrous sulphate was increased by 5.81% and 0.26% in the 1st and 4th peak respectively, but the Tmax of 2nd and 3rd peaks were decreased by 2.58% and 2.38%, respectively compared to the control sample. As per the literature, with alteration of the particle size changed the thermal stability of a sample . Overall, TGA/DTG revealed that the thermal stability of the Biofield Energy Treated ferrous sulphate was altered as compared with the control sample. Table 5. The maximum thermal degradation temperature (Tmax) of the control and Biofield Energy Treated samples of ferrous sulphate. P1, P2, P3, and P4: peak 1, 2, 3, and 4. *denotes the percentage change of the Biofield Energy Treated sample with respect to the control sample. Figure 4. DTG thermograms of the control and Biofield Energy Treated ferrous sulphate. The Trivedi Effect® - Energy of Consciousness Healing Treatment has shown the significant impact on the relative intensity and crystallite size of the diffraction peaks, particle size, surface area, and thermal properties of ferrous sulphate. The PXRD diffractograms of both the sample showed sharp and intense peaks indicated that the ferrous sulphate was crystalline in nature. The relative intensities and crystallite size of the characteristic diffraction peaks in the Biofield Energy Treated sample were significantly altered in the range from - 26.74% to 421.23% and from -24.93% to 42.91%, respectively compared with the control sample. The average crystallite size of the Biofield Energy Treated sample was significantly increased by 6.39% compared with the control sample. The particle size values at d10, d50, d90 and D(4, 3) values were significantly increased by 30.43%, 35.94%, 19.49%, and 26.26%, respectively and the surface area was significantly decreased by 53.26% compared with the control sample. The melting temperature of the Biofield Energy Treated sample in the 1st and 3rd peaks was increased by 1.61% and 1.04% respectively; whereas decreased by 5.71% and 1.04% in the 2nd and 4th peaks, respectively compared with the control sample. Similarly, the latent heat of fusion (∆H) of 1st and 3rd peaks in the Biofield Energy Treated ferrous sulphate was significantly increased by 9.98% and 5.32% respectively; whereas ∆H of the 2nd and 4th peak was decreased by 15.46% and 6.10%, respectively compared with the control sample. The TGA thermograms of both the samples exhibited four steps of thermal degradation. The total weight loss in the Biofield Energy Treated ferrous sulphate was enhanced by 0.62% compared with the control sample. The maximum thermal decomposition temperature (Tmax) of the Biofield Energy Treated ferrous sulphate was increased by 5.81% and 0.26% in the 1st and 4th peak respectively, but the Tmax of 2nd and 3rd peaks were reduced by 2.58% and 2.38%, respectively compared to the control sample. Overall, DSC and TGA/DTG of the treated sample showed that the thermodynamic stability was changed compared with the control sample. These results suggested that The Trivedi Effect® - Consciousness Energy Healing Treatment might lead to the production of a polymorphic form of ferrous sulphate, which would provide better powder flowability and appearance having altered thermal stability compared with the control sample. The Alice’s Biofield Energy Treated ferrous sulphate would be beneficial to design better nutraceutical and/or pharmaceutical formulations which might offer better therapeutic response against iron deficiency anemia. Reddy SN, Rao PS, Ravikumar RV, Reddy BJ, Reddy YP (2001) Spectral investigations on melanterite mineral from France. Spectrochim Acta A Mol Biomol Spectrosc 57: 1283. Lide, David R., ed. (2009) CRC Handbook of Chemistry and Physics (90th ed.). Boca Raton, Florida: CRC Press. Jančovičová V, Čeppan M, Havlínová B, M. RehákováZ. Jakubíková (2007) Interactions in iron gall inks Chemical Papers 61: 391–397. Koenig R, Kuhns M (2010) Control of iron chlorosis in ornamental and crop plants. Utah State University, Salt Lake City, August. Hayyan M, Hashim MA, AlNashef IM (2016) Superoxide ion: generation and chemical implications. Chem Rev 116: 3029-3085. Fenton HJH (1894) Oxidation of tartaric acid in presence of iron. J Chem Soc 65: 899-911. Bothara KG (2007) Inorganic Pharmaceutical Chemistry. 9th Edition, Nirali Prakashan, Pune, India. Zariwala MG, Somavarapu S, Farnaud S, Renshaw D (2013) Comparison study of oral iron preparations using a human intestinal model. Sci Pharm. 81: 1123-1139. Zimmermann MB, Hurrell RF (2007) Nutritional iron deficiency. Lancet. 370: 511-520. Trivedi MK, Branton A, Trivedi D, Nayak G, Lee AC, Hancharuk A, Sand CM, Schnitzer DJ, Thanasi R, Meagher EM, Pyka FA, Gerber GR, Stromsnas JC, Shapiro JM, Streicher LN, Hachfeld LM, Hornung MC, Rowe PM, Henderson SJ, Benson SM, Holmlund ST, Salters SP, Panda P, Jana S (2017) A comprehensive analytical evaluation of the Trivedi Effect® - Energy of Consciousness Healing Treatment on the physical, structural, and thermal properties of zinc chloride. American Journal of Applied Chemistry 5: 7-18. Trivedi MK, Branton A, Trivedi D, Nayak G, Nykvist CD, Lavelle C, Przybylski DP, Vincent DH, Felger D, Konersman DJ, Feeney EA, Prague JA, Starodub JL, Rasdan K, Strassman KM, Soboleff L, Mayne MA, Keesee MM, Pillai PN, Ansley PC, Schmitz RD, Sodomora SM, Sethi KK, Panda P, Jana S (2017) Evaluation of the Trivedi Effect®- Energy of Consciousness Energy Healing Treatment on the physical, spectral, and thermal properties of zinc chloride. American Journal of Life Sciences. 5: 11-20. Inoue M, Hirasawa I (2013) The relationship between crystal morphology and XRD peak intensity on CaSO4 2H2O. J Crystal Growth 380: 169-175. Wang T, Debelak KA, Roth JA (2007) Dehydration of iron (II) sulfate heptahydrate. Thermochimica Acta 462: 89-93. Földvári M (2011) Handbook of thermogravimetric system of minerals and its use in geological practice. Vol. 213, Occasional Papers of the Geological Institute of Hungary, Budapest.